LIAM McMorrow's fine play in a globe-trotting career has not gone unnoticed. 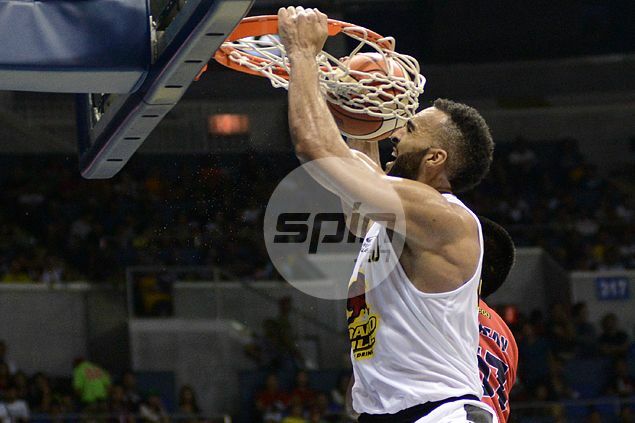 The 7-2 import who has transformed Barako Bull from a perennial doormat to PBA Governors Cup leader has received invitations to attend summer camp of at last two NBA teams including the Los Angeles Clippers, team officials confirmed. McMorrow, a former ice hockey player in his native Canada who took up basketball seriously just eight years ago, went undrafted in the 2012 NBA rookie draft but has since shown a lot of improvement in stints in leagues around the world. After a fine performance in Canada's top basketball league, the 27-year-old has taken the PBA by storm with averages of 29 points and 23.6 rebounds in leading Barako Bull to a league-best 6-1 (win-loss) record. Those stints have apparently attracted attention from scouts who have extended invitations to attend the summer camp of two NBA teams. The more attractive offer came from the Clippers, whose starting center, DeAndre Jordan, is a free agent in the NBA offseason. Barako fans, however, have no reason to fear. NBA summer camps will not start in a couple of months, giving McMorrow enough time to finish off what should be one of the most impressive performances of Barako in franchise history.